Fresh Mango with Ice cream is really easy to make at home. It has full of mango flavor with rich, creamy taste. Try this recipe at home to give smile on everyone’s face. 1. Wash, peel and chopped the mangoes. 2. Blend the Mangoes, vanilla essence and sugar in a smooth pulp. 3. Whip the cream and add the mango pulp on the cream. Mix it well. 4. Check the sweetness and if required, then add some more sweets. 5. Pour it in a container and keep it in the freezer. Cover the container tightly. 6. When the ice cream is about to set or half frozen, remove it from the freezer. 7. Whip again for few minutes. 8. Pour it on the same container again. 9. Freeze it till set. 10. If required whip it again when it is about to set. 11. 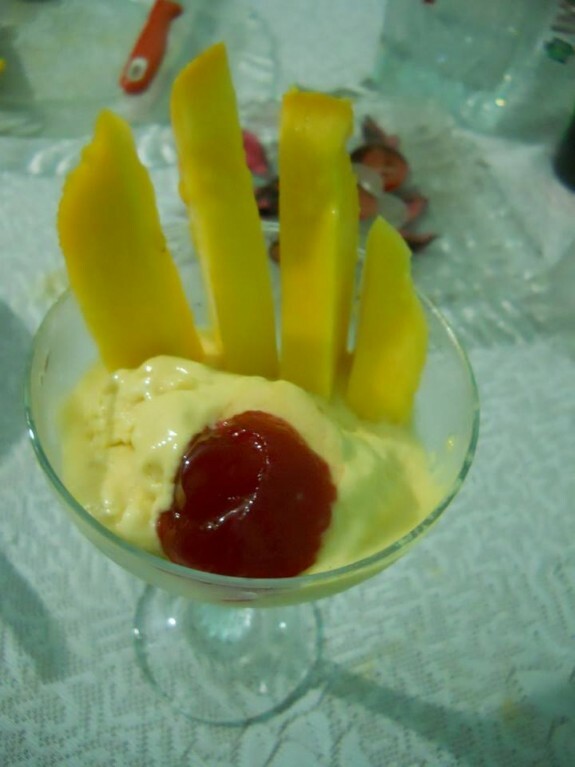 Scoop the Mango Ice cream and serve it with fresh mango slices, honey and mixed fruit jam on top.